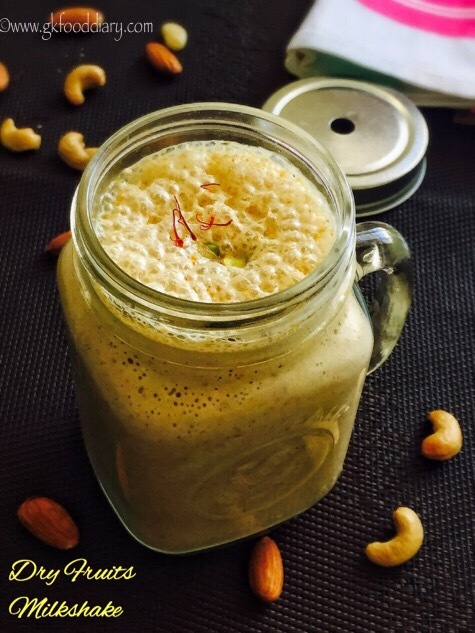 Dry Fruits Milkshake – fresh, homemade, healthy milkshake with dry fruits and nuts. 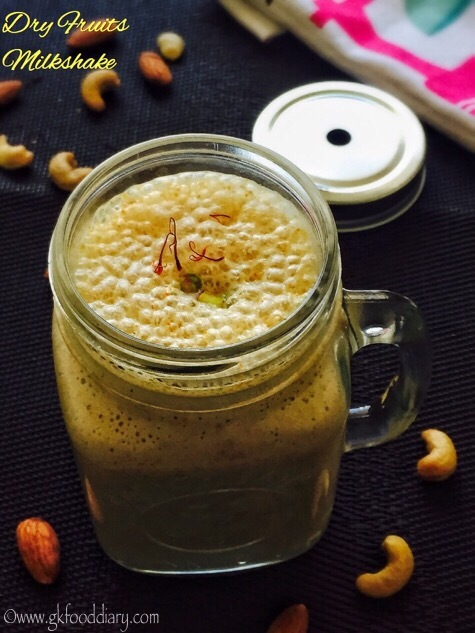 This dry fruits milkshake is one of the best way to include nuts and dry fruits in kids diet, as its very tasty and addictive:) It is also considered as one of the best weight gaining recipe for kids as it has all the essential nutrients required for the kids. Dry fruits milkshake is so filling and hence it can be given as a breakfast when your kid fusses about food. 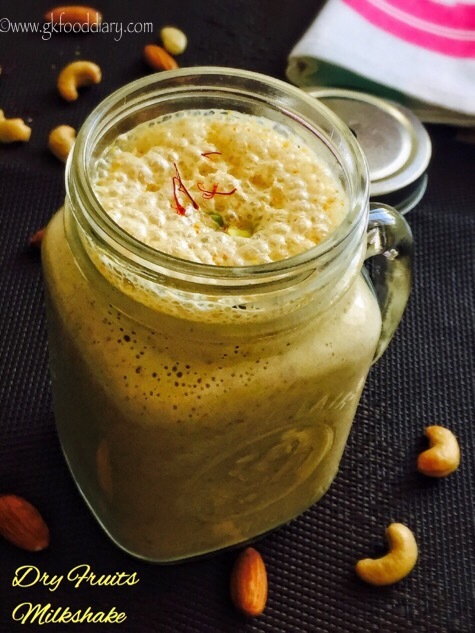 Soaking nuts and dry fruits before making this milkshake is optional but reduces the heat caused from nuts. This dry fruits milkshake can be given to Toddlers from one year after introducing all nuts & dry fruits separate and ruled out allergies. Now let’s get on to check how to make dry fruits milkshake recipe for toddlers and Kids. Keep all the ingredients ready. Soak all the nuts and dry fruits in warm water for 30 minutes. Soak saffron in a tbsp of milk and set aside. After 30 minutes, take the soaked nuts, saffron mix and sugar in a blender. Add 1 cup of milk now. Grind the nuts and dry fruits to a smooth paste. Once the nuts and dry fruits are ground smooth, add the remaining 2 cups of milk. Run the blender/mixie again for 30 seconds. Pour the dry fruits milkshake in glasses and serve. 1. Keep all the ingredients ready. 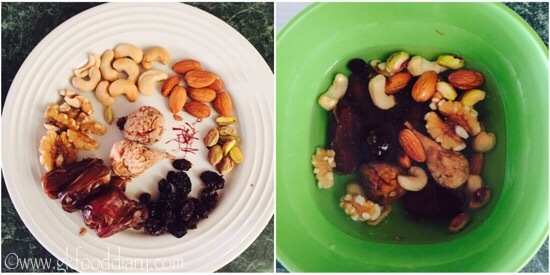 Soak all the nuts and dry fruits in warm water for 30 minutes. 2. Soak saffron in a tbsp of milk and set aside. 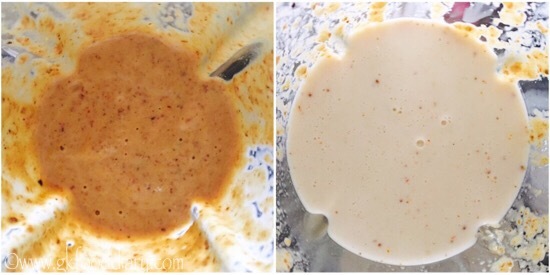 After 30 minutes, take the soaked nuts, saffron mix,cardamom powder and sugar in a blender. Add 1 cup of milk now. 3. Grind the nuts and dry fruits to a smooth paste. 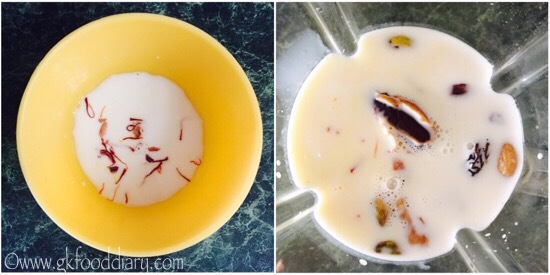 Once the nuts and dry fruits are ground smooth, add the remaining 2 cups of milk. 4. Run the blender/mixie again for 30 seconds. Pour the dry fruits milkshake in glasses and serve. 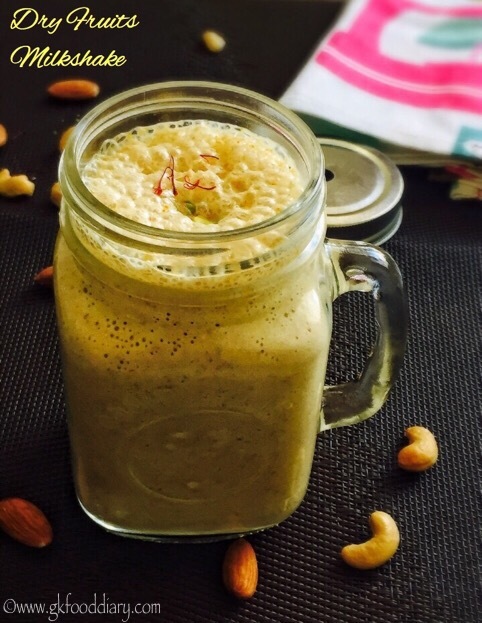 Healthy and tasty dry fruits milkshake is ready! For small kids, Make sure to grind the nuts and dry fruits to a smooth paste in order to avoid choking. Soaking the nuts and dry fruits is optional, but recommended during summer as soaking reduces the heat caused by nuts. With the above mentioned ingredients and quantity, this makes 4 servings. When you introduce this milkshake to your kid, give small amount. Skip sweetener if the sweetness from the dry fruits are sufficient. You can use nuts and dry fruits of your own choice. 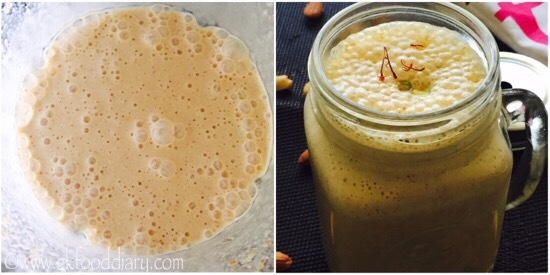 Make sure to try this dry fruits milkshake recipe after introducing each ingredient separate to your kid. Wow!! Great recepie for kids like mine who hate to eat dry fruits. Thank you for sharing awesome recepies and I’l surely try this for my son. I’v just started my blog and I’m getting a lot to learn from your’s. Thank you!